This entry was posted in Early Modern, Leather Vessels, Modern, Pitch and tagged Bucket, drinkware, gallery, Jack, Mary Rose, pitch, Stuart. Bookmark the permalink. Hello Wayne, it’s been a while! Hope all is well in your part of the world. Pleading: Thomas Hynstoke and his wife Joan Hynstoke claim that Roger Sergeant and his wife Joan Sergeant unjustly detain their chattels to the value of 100s. TH and JH say that they gave these chattels to JS for safe keeping whilst she was a single woman, and that the defendants will not return them. 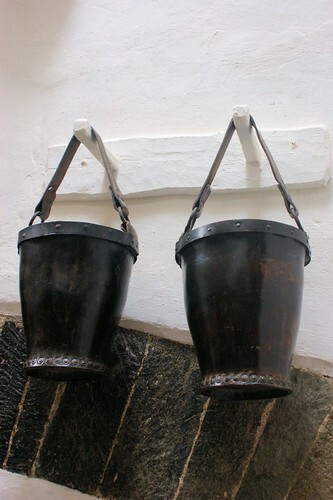 The chattels in question are namely: one pair of jugs (unam par obbarum) containing 16 gallons; one pair of jugs (obbarum) called ‘stage bottles’ containing 4 gallons; one pair of jugs (obbarum) containing 10 gallons; 20 forms; and 2 forms called ‘collock forms'(fn1). Damages are claimed at £10. Joan Sergeant, Defendant, Roger Sergeant, Bottle-maker, London England, Defendant. 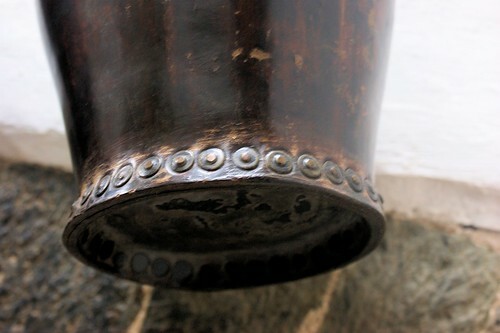 The defendant’s profession is given as bottle-maker; bottle-maker, based on a cross-reference to other records I’ve found in this time period, appears to refer to a maker of leather bottles (and related wares usually just referred to as “pots” which seems to mean things like pitchers/jugs/buckets). While I can’t be sure, I think there’s a good chance this may refer to molds for what later became known as blackjacks! At first I was really surprised by the sizes of the jugs 16 and 10 gallons seemed enormous, but really, a jug 20 inches high with a 12 inch diameter would hold about 10 gallons, and for 16 gallons you’d need 22 tall by 14″ diameter, not entirely inconceivable. 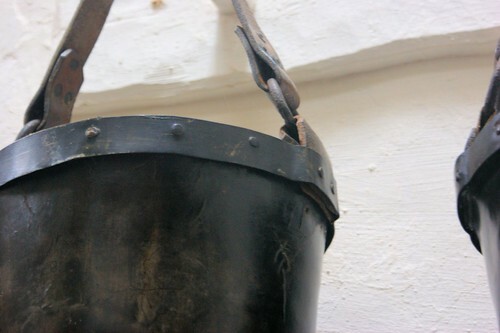 fn1: “Collock” is described in The Universal Etymological English Dictionary, edited by Nathan Bailey (1736), as a “pail with one handle”. Hi Holly, I hope you’re keeping well. I think you’re right about the forms. The etymological dictionary gives the origin of the word “form” as ‘early 13c., from Old French forme “physical form, appearance, pleasing looks; shape, image,” from Latin forma “form, contour, figure, shape; appearance, looks’ model, pattern, design; sort, kind condition,” origin unknown.’ The other meanings of the word are much later. 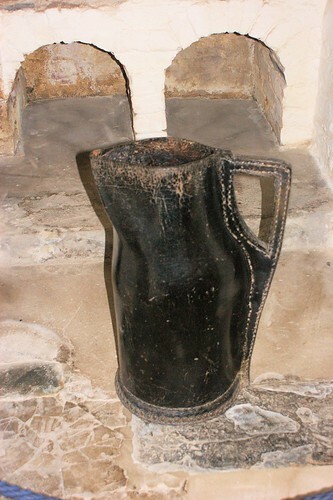 Those volumes are well within the normal range of the bombard type of jug, the Cotehele House one pictured above would have been 9 or 10 gallons, it was 20 inches high and just under a foot in diameter. 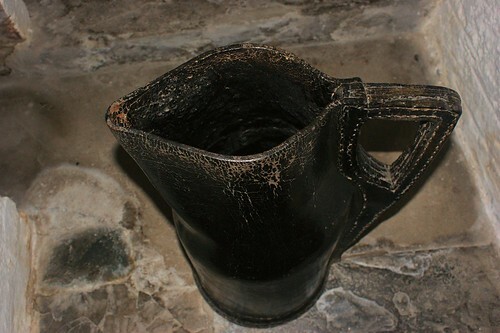 Anyone claiming to be a bottle-maker from London in a court of law would have been a member of the bottlermaker’s guild who worked exclusively in leather. Nice part of the world, Toronno. I had a spare 3 hours there once on a business trip and really liked the place and people.